Read on for a full transcript and photos. Many of us were wearing Babbler devices for this first meeting, which automatically translated our text chat into French. Pathfinder Lester: i’ll kick things off now. 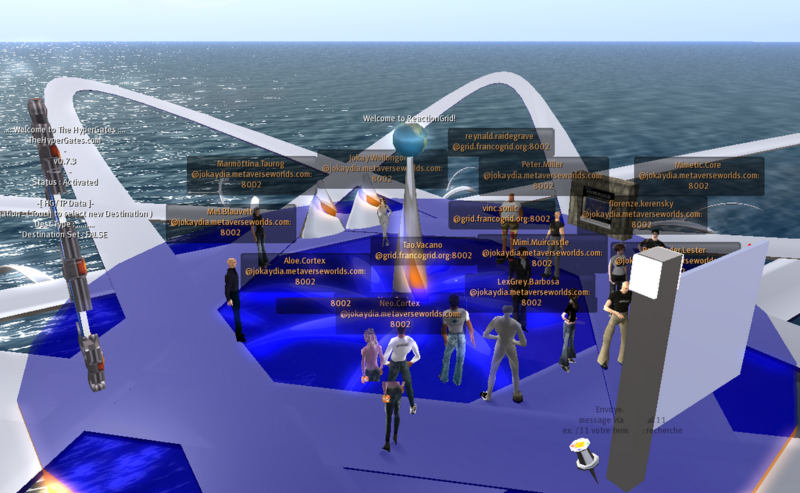 welcome to the Hypergrid Adventurers Club! thank you all for coming…..
Pathfinder Lester: Je vais kick off choses maintenant. Bienvenue au Club Hypergrid aventuriers! je vous remercie tous d’être venus …..
Pathfinder Lester: it’s nice for everyone to introduce themselves in open chat, so please say whatever you like about yourself and your interests/projects…. Pathfinder Lester: il est bon pour tout le monde de se présenter en séance publique chat, donc s’il vous plaît dire ce que vous aimez en vous et de vos intérêts et des projets…. Pathfinder Lester: and if you do NOT wish your chat to be posted on my blog, please just say so in open chat and I will redact your comments. Pathfinder Lester: et si vous ne voulez PAS que votre chat d’être posté sur mon blog, s’il vous plaît dites-le au chat ouverte et je vais rédiger vos commentaires. We will be meeting a French group of fellow Hypegrid travelers at this location. They are participating in a Virtual Worlds Camp. (http://vwcamp.org) Let’s explore with them! I’ll be passing out Babbler devices that will automatically translate chat back and forth between french and english so we can all understand each other. florenze kerensky: virtual world vagabond since 2000, likes to travel in rl also. i have been a resident of SL since 2004 and host The Show and Tell with barney boomslang in Avaria Sav. 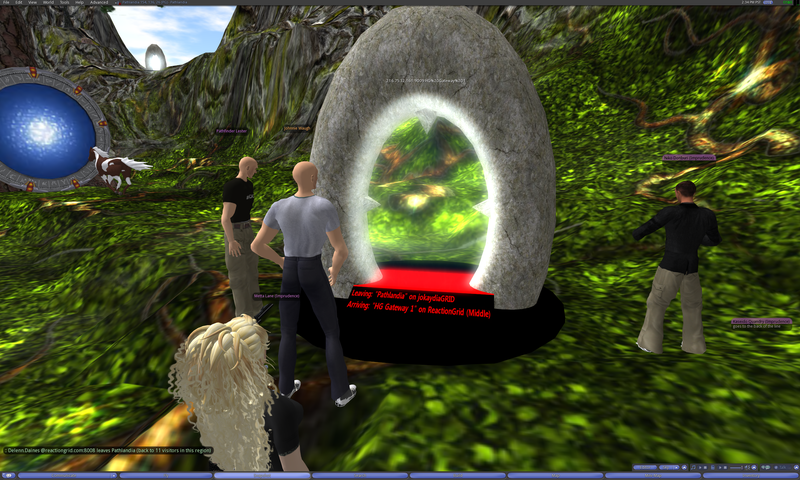 Mimi Muircastle: Aloe, do you write about your experiences in virtual worlds? Mimi Muircastle: Aloe, écrivez-vous de vos expériences dans les mondes virtuels? LexGrey Barbosa: yo hablo español. pongo el traductor en inglés o francés ? 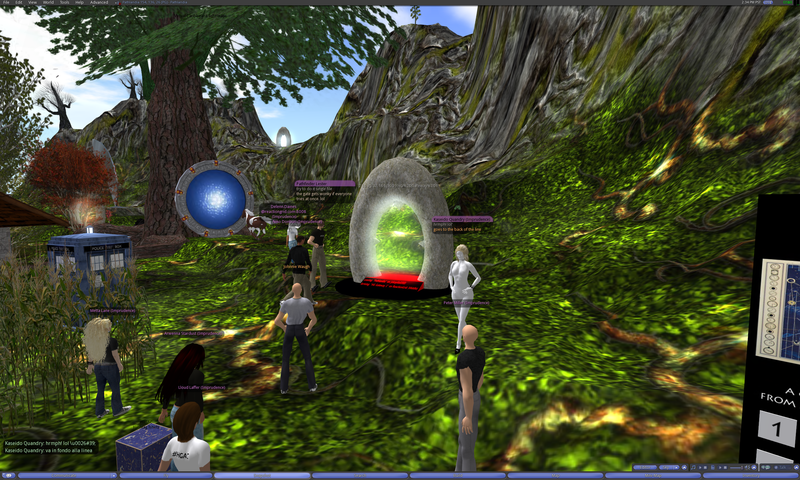 The group walks through an Instant Hypergate on the region Pathlandia on jokaydiaGRID. Mimi.Muircastle: did our inventories jump with us? Mimi.Muircastle: fait nos inventaires sauter avec nous? LexGrey.Barbosa: for the distances ? Pathfinder.Lester: and lower to middle. but NOT lower to Upper. Pathfinder.Lester: boy, that sounds confusing. Marmottina.Taurog: How do we actually make the jump, using the map ? Pathfinder.Lester: marmottina, how do we make what jump? Marmottina.Taurog: into another grid ? Pathfinder.Lester: Marmottina, there are different ways to jump to other grids. Pathfinder.Lester: you’ve already made a jump! Mal.Burns: hah – you just did! Pathfinder.Lester: that’s one way to make jumps. ppl can set up instant jumpgates like mine. Marmottina.Taurog: right so that’s what we would do next ? Mimi.Muircastle: can a hypergate be set to a variety of grids or only to one specific place? Mimi.Muircastle: peut-on hypergate être réglé à une variété de grilles ou seulement à un endroit précis? Pathfinder.Lester: you need to know the hypergrid address of where you want to jump. Pathfinder.Lester: Marmottina, yep, you got it. Peter.Miller: I think Path said there is a directory under construction? Peter.Miller: Je pense que le chemin a dit il ya un répertoire en cours de construction? Mimetic.Core: sometimes, if i wish really, really hard i spontaneously teleport to cool places througout the grids. Mimetic.Core: parfois, si je veux vraiment, vraiment dur i spontanément téléport de beaux endroits througout les grilles. Pathfinder.Lester: these “stargate” hypergates are scripted to be part of a network…..
Pathfinder.Lester: but ONLY if the location has a stargate hypergate rezzed on it. Kev Jenkins, Reynald Raidegrave, Vinc Sonic, Tao Vacano, and Ssm2017 Binder arrive from FrancoGrid to meet with us and say hello. LexGrey.Barbosa: the 1.5 is for opensim 0.7 ? Pathfinder.Lester: 1.0 and 1.5. you can’t jump between them. but everyone is working to upgrade to 1.5 very soon. Pathfinder.Lester: 1,0 et 1,5. vous ne pouvez pas passer d’eux. mais tout le monde travaille pour mettre à niveau à 1,5 très bientôt. Pathfinder.Lester: reynald, i am good, my friend. how is the VWCamp going? Pathfinder.Lester: Reynald, je suis bon, mon ami. comment est la VWCamp va? Pathfinder.Lester: he is famous. his band “They Reymones” performs live often. Pathfinder.Lester: il est célèbre. son groupe “Ils Reymones” se produit sur scène régulièrement. Marmottina.Taurog: Cool music Reynald ! Marmottina.Taurog: Cool la musique Reynald! Pathfinder.Lester: someone was mentioning how to find the hypergrid addresses of different locations on the hypergrid…..
Pathfinder.Lester: une personne a été citant comment trouver les adresses hypergrid de différents endroits sur le hypergrid …..
Pathfinder.Lester: but there are different lists that are starting to come together. Pathfinder.Lester: mais il ya des listes différentes qui commencent à se rassembler. Pathfinder.Lester: in time, they will all coalesce i think. Pathfinder.Lester: dans le temps, ils vont tous se fondre je pense. Marmottina.Taurog: it’s exciting stuff ! Marmottina.Taurog: il est des choses passionnantes! Marmottina.Taurog: quelle traduction atroce ! Pathfinder.Lester: neo, that would be great. Maria Korolov has joined us in the past, but I’ve never met Kidd Pico. Pathfinder.Lester: neo, ce serait formidable. Maria Korolov s’est joint à nous dans le passé, mais je n’ai jamais rencontré Kidd Pico. 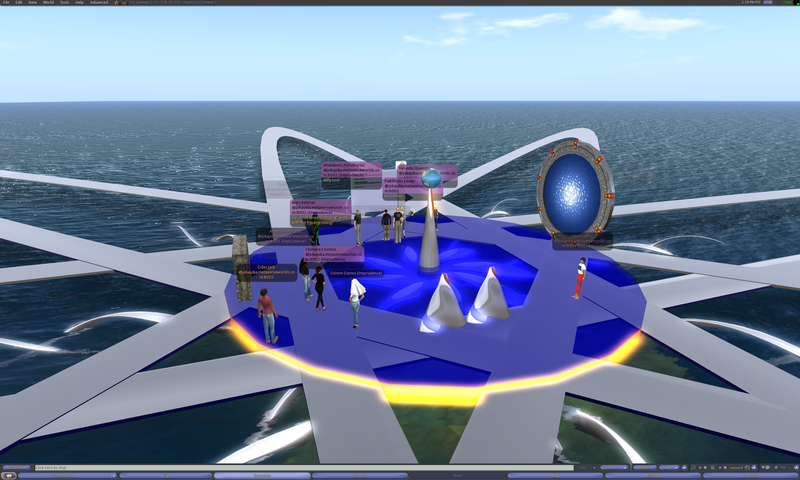 Pathfinder.Lester: there is another interesting hypergrid device on this region…. Pathfinder.Lester: il ya un autre appareil hypergrid intéressants sur cette région …. Pathfinder.Lester: big white board. HGurl sign on it. Pathfinder.Lester: grand tableau blanc. Inscrivez-vous HGurl sur elle. Pathfinder.Lester: i just searched for “Pathlandia” and it found it. see it on the board? Pathfinder.Lester: Je viens de la recherche de “Pathlandia” et il l’a trouvé. le voir sur la carte? Mimi.Muircastle: I see your address on Joykaydia, right? Mimi.Muircastle: Je vois votre adresse sur Joykaydia, non? Pathfinder.Lester: but the ability to search using keywords is really awesome! Pathfinder.Lester: mais la capacité de recherche par mots clés est vraiment génial! Pathfinder.Lester: Mimetic, oh you do? that makes sense. Pathfinder.Lester: Mimetic, oh tu faire? qui a du sens. Pathfinder.Lester: hello Tao and Vinc! Pathfinder.Lester: Bonjour Tao et Vinc! 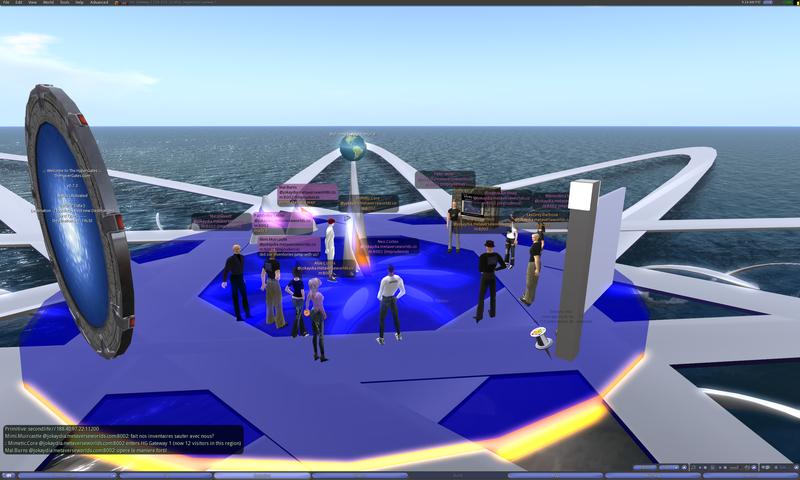 Pathfinder.Lester: this region we are now on is on ReactionGrid, in the Middle of the hypergrid. Pathfinder.Lester: cette région nous est désormais sur ReactionGrid, dans le milieu de la hypergrid. 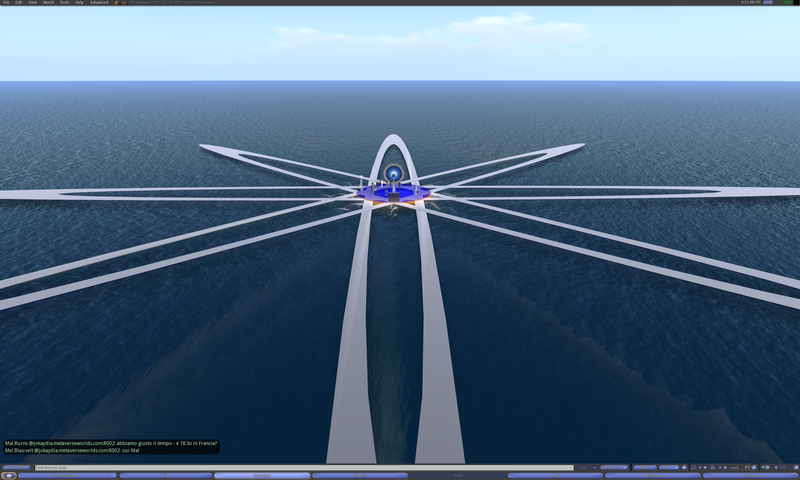 Pathfinder.Lester: there is another gateway called “HG Gateway 2″….also ReactionGrid, but on the Upper hypergrid. Pathfinder.Lester: il ya une autre passerelle appelée “HG Gateway 2 “…. aussi ReactionGrid, mais sur le hypergrid supérieur. Pathfinder.Lester: since I now work for ReactionGrid, I can build on both of them. so I will be adding things to both of them to help people jump to different places. Pathfinder.Lester: depuis que je travaille maintenant pour ReactionGrid, je pourrai m’appuyer sur deux d’entre eux. Je serai donc à ajouter des choses à tous les deux pour aider les gens passer à des endroits différents. Mimi.Muircastle: I just love this translation machine! Mimi.Muircastle: J’adore cette machine de traduction! Pathfinder.Lester: these babblers will be very handy for future HGAC trips. Pathfinder.Lester: ces bavards sera très pratique pour les voyages HGAC avenir. Pathfinder.Lester: next week i am planning for us to visit some german locations. Pathfinder.Lester: i la semaine prochaine me prépare pour nous de visiter certains sites allemands. Mimi.Muircastle: it does not correct mispellings! Mimi.Muircastle: elle ne corrige pas mispellings! Mimi.Muircastle: ty Vinc – historic occassion! Mimi.Muircastle: Ty Vinc – occasion historique! Pathfinder.Lester: my french is rusty, so babbler helps me learn too. Pathfinder.Lester: mon français est rouillé, si bavard m’aide à apprendre aussi. Mimi.Muircastle: this is language immersion! vinc.sonic: Tao c’est a quel heure la presentation valueforall ? Peter.Miller: The vwcamp is continuing? Peter.Miller: Le vwcamp se poursuit? Mimi.Muircastle: this is making me begin to think in french! Mimi.Muircastle: ce qui me fait commencer à penser en français! Pathfinder.Lester: Mimi, me too. helps me so much to learn. Pathfinder.Lester: Mimi, moi aussi. m’aide beaucoup à apprendre. Pathfinder.Lester: Neo, ah i see. Pathfinder.Lester: Neo, ah je vois. Mimi.Muircastle: so literal instead of idiomatic? Mimi.Muircastle: tellement littérale au lieu de idiomatiques? Pathfinder.Lester: maybe like a train station. so people can hang out and meet people who are passing through. Pathfinder.Lester: peut-être comme une gare. que les gens puissent sortir et rencontrer des gens qui sont de passage. Mimi.Muircastle: me too this has been fun:) ty again Path! Mimi.Muircastle: moi aussi cela a été amusant:) ty nouveau chemin! Pathfinder.Lester: have a great day. bye! Pathfinder.Lester: ont une belle journée. bye! Pathfinder Lester: how’s everyone doing this evening? our meeting officially starts at 10pm GMT, so more folks should be coming soon. Anastasios Aurotharius: how are you, Pathfinder? Pathfinder Lester: Thinkerer, oh cool! Lloud Laffer: My first taste of hypergridding as well. Lloud Laffer: I was aplogizing to Anastasios for my appearance – still not grasping inventory transfer. Pathfinder Lester: if you’ve never hypergrid jumped before, there’s one thing you need to do first…..
Pathfinder Lester: you need to have set your home location. hypergrid jumps won’t work until you’ve done that and have relogged since you first set your home. Pathfinder Lester: so feel free to set your home to this location if you wish. and relog. Anastasios Aurotharius: at the risk of sounding foolish…how do you do that? Lloud Laffer: ok excellent. will do. 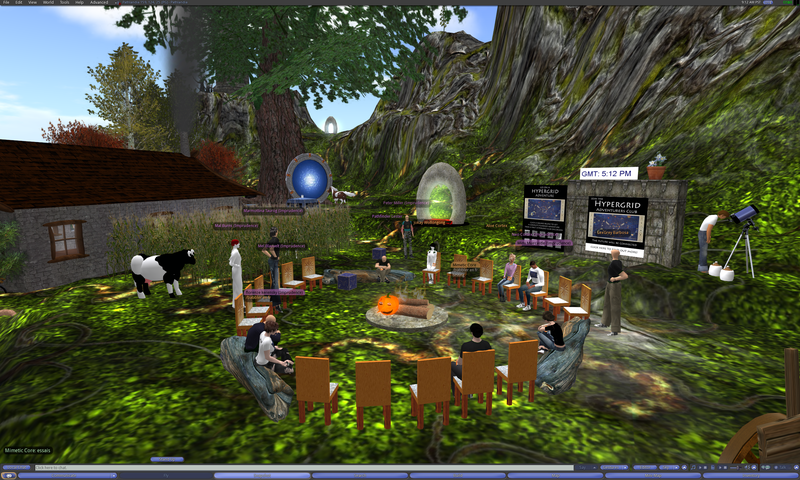 Pathfinder Lester: the hypergrid protocol needs to “know” you have a home before you can jump between grids. Pathfinder Lester: ok, i’ll officially kick things off…. Pathfinder Lester: the first half of each of our meetings (30min) is an open discussion. Lloud Laffer: Good one Metta, me too. I feel nothing like myself! Pathfinder Lester: we like to start by having folks just introduce themselves in open chat. say whatever you’d like about yourself and your interests/projects. Pathfinder Lester: i also post a full transcript of every meet on my blog, so this is your chance to introduce yourselves and your projects/interests to a wider audience…. Pathfinder Lester: and if you do NOT wish for your chat to appear in my blog transcript, please just say so and I will redact your comments from the transcript. 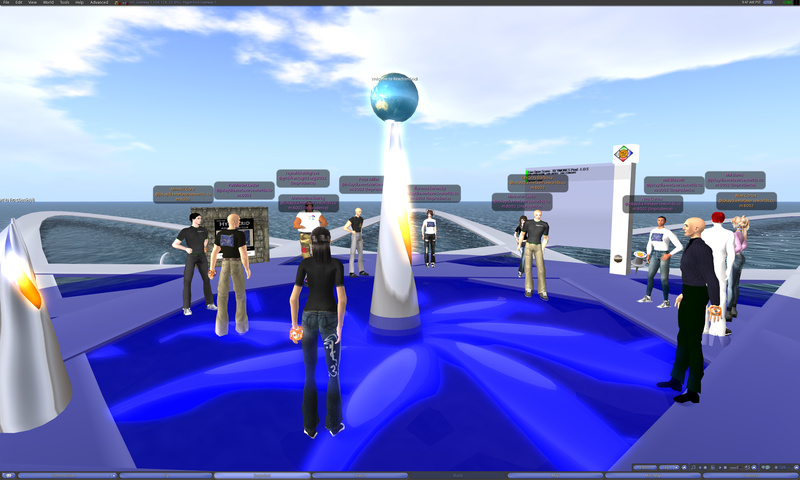 Mari Asturias: Hi, I’m Mari Asturias for 5 years in SL .. I’m grieving my inventory ATM 🙂 I am and work with educators – with SDSU and other orgs .. I did some Global Kids work and I’m REALLY interested in hypergridding yay!! This location features an accurately scaled reconstruction of the Eiffel Tower based on real life architectural plans, as well recreations of other classic French buildings. Niko Donburi: I’m Niko, nice to meet everyone. In SL I’m known for my live music performances (Google me for links, downloads, etc). Here on the Hypergrid I am working on some machinima and photography which you can see at my deviantART site. Lloud Laffer: Hi, I’m Lloud Laffer, about 5 years in VWorlds as well. I’m interesing in distance learning technology. Pathfinder Lester: yes, a good idea! Chimera Cosmos: I’m Chimera Cosmos on a bunch of grids but lived on Jokaydia in SL since 2008. Been in SL since Fall 2006. Pathfinder Lester: yeah, it’s a great project! Johnnie Waugh: Member of VLENZ, builder of Andelain on NZVWG. 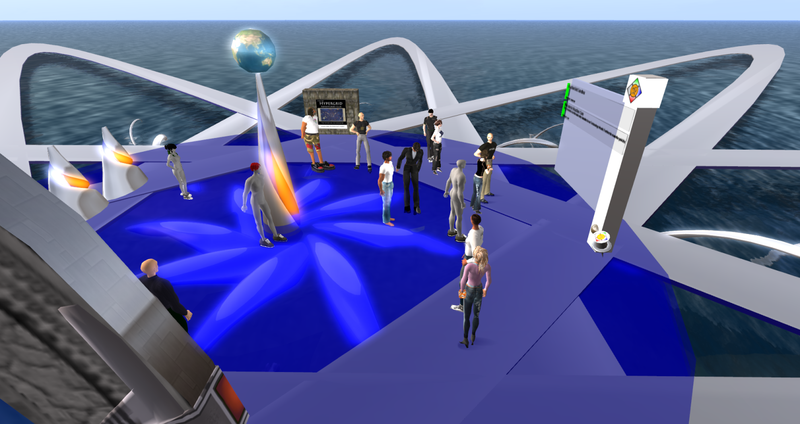 Chimera Cosmos: I like teaching basic SL skills to faculty and folks to help them integrate here, and doing touring and stuff. Pathfinder Lester: lots of interesting virtual world projects coming out of Australia and New Zealand. Chimera Cosmos: Pim, the main reason I made another Chimera over on Franco grid was cuz I was so sad I missed Pandora! Arwenna Stardust: the photos looked amazing! Pathfinder Lester: oh cool. i’ll grab one there. Chimera Cosmos: Can you get us back in there Path? Why is it closed? Pathfinder Lester: since we have a few ppl here who have never hypergrid jumped before, if you folks have any questions please ask in chat and we’ll do our best to answer. Pathfinder Lester: Chimera, i don’t know why it’s closed. the region owner just has it that way. Delenn.Daines: are we going to hypergrid jump today? Arwenna Stardust: Mari – it is great! Lloud Laffer: does hypergridding scramble our atoms across the universe?! Pathfinder Lester: Niko, good question. Pathfinder Lester: but Hyperica is a manually curated list of addresses, so not everything will be on that site. Pathfinder Lester: so 1 way you can hypergrid jump is the “manual” way…..
Pathfinder Lester: typing in hypergrid addresses in the world map and searching for them…..
Niko Donburi: so do I put all of this in: secondlife://85.214.144.62:9000 or remove some of it? Pathfinder Lester: if you open the notecard i passed around, there are instructions on how to manual jump in the notecard. Pathfinder Lester: the reason for that is…..
Mari Asturias: How long until jokaydia upgrades? Pathfinder Lester: 1.5 was just recently released, so many grids are still working on upgrades. Pathfinder Lester: Mari, i’m not sure. probably a month or so? 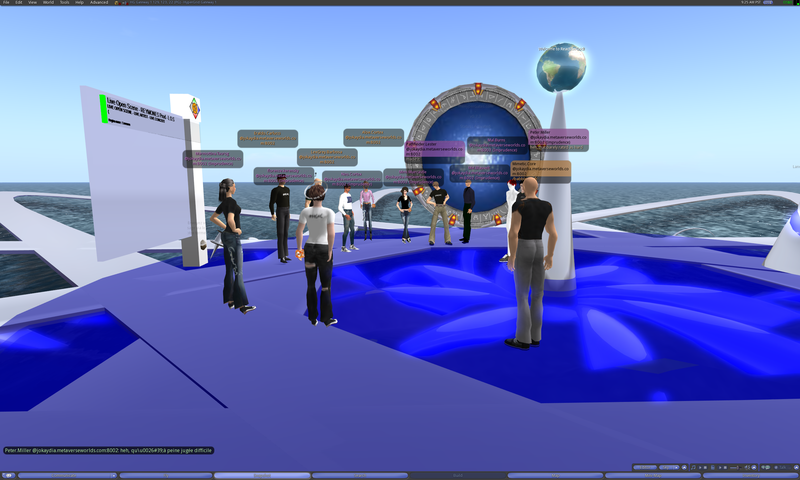 Arwenna Stardust: and OSGrid is running Os 7 and we are still on 6.9 ? Arwenna Stardust: does that make a difference too? Pathfinder Lester: lots of edus and businesses use ReactionGrid, so stability is really important to them. Talvin Muircastle: Heh. What version does the Documentation Wiki use? Talvin Muircastle despairs of the wiki. First step in writing any script: do tests, see if it really works like that here. Lloud Laffer: yah, I would hate to be them. so hard to keep up with viewers. Pathfinder Lester: a gate object inworld that is scripted to instantly take you to a specific grid when you walk into it. Pathfinder Lester: now when you jump to other grids….your identity, avatar and inventory remain with you. Cider Jack: to get back do we use a etagmalb? Lloud Laffer: amazing. in my short usage I have been quitting between each grid change. already learning new things. Lloud Laffer: I get it – that is so awesome. Pathfinder Lester: any questions so far? Lloud Laffer: so uuids can be accessed outside of being loged-in? does that questino make sense? Pathfinder Lester: Lloud, I’m not sure about that, technically. Kaseido Quandry: ahh, good tip, thanks! Pathfinder Lester: let me find a helpful page on how hypergridding works. Pathfinder Lester: Cider, yeah, that’s how it works pretty much. Lloud Laffer: I don’t think uuids are accessibel without being loggedin – it must be that inventory is transferred locally by the client. Pathfinder Lester: so rule of thumb…. Delenn.Daines: I am curious as to why my avie looks like it has stripes of yellow and purple. Something to do with my graphics settings? Arwenna Stardust: LOL!! nicely put Path! Lloud Laffer: I AM NOT RUTH! Arwenna Stardust: ah and take a HGAC T shirt while you are here! Pathfinder Lester: i also handed out a Babbler device to everyone…..
Lloud Laffer: oh yah, where’s the tshirts? Pathfinder Lester: just wear that…..
Arwenna Stardust: so what will we need today Path? Johnnie Waugh: upper and lower? Pathfinder Lester: ah, yes, upper and lower….i will explain…. Pathfinder Lester: all of the different grids are all laid out in a big map…..
Pathfinder Lester: but there is a bug right now that does not let you jump further than 4096 regions away…..
Pathfinder Lester: FrancoGrid is Upper. Arwenna Stardust: where you find the most interesting people! Cider Jack: where all the best restraunts are! Mari Asturias: groovy .. let’s go! Cider Jack: I’ve got a question – when do we eat? Anastasios Aurotharius: does everyone have their parachute? Talvin Muircastle: Joel: Phoenix and OpenSimulator don’t seem to get along. Pathfinder Lester: our first jump today will be thru this gate over here…..
Pathfinder Lester: room for everyone in this train. no pushing! Talvin Muircastle speaks from practical experience on that one. Pathfinder Lester: see you there! Mari.Asturias: So… how does “friending” work with the hypergridding? Lloud.Laffer: friends and inventory seem preserved. Pathfinder.Lester: any questions so far? Niko.Donburi: make a LM here everyone, good to have! Delenn Daines: bc we are on a different grid? Kaseido.Quandry: yep – tagged with our homeworlds? Pathfinder.Lester: so we started on jokaydiaGRID. now we’re on ReactionGrid. and we’re headed to FrancoGrid. Anastasios.Aurotharius: what would Dorothy think? Delenn Daines: now if I could only have my inventory from sl! Lloud.Laffer: jump there – don’t log out. Anastasios.Aurotharius: lions and tigers and bears….oh…my…. Jenny.Oliver: I came from Midrivers Project! Lloud.Laffer: Ah, got it! Off to Eiffel- mon dieu! Pathfinder.Lester: see you at Eiffel! 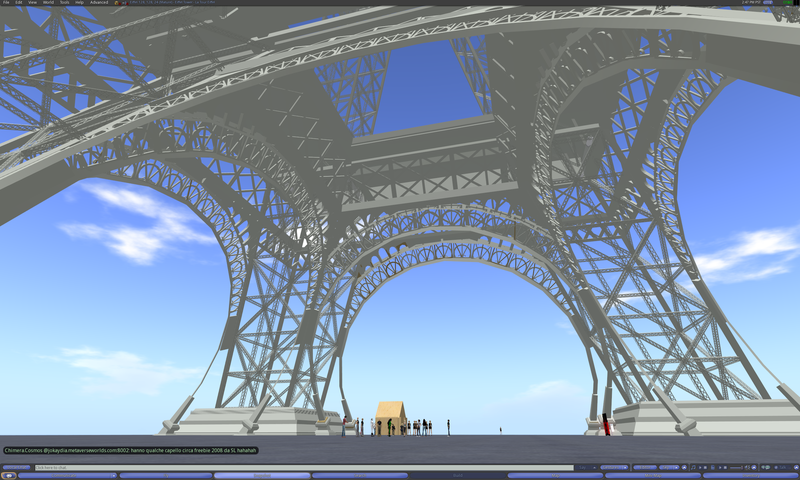 The group makes a manual Hypergrid jump from the region HG Gateway 1 on ReactionGrid to the region Eiffel on FrancoGrid. Chimera.Cosmos: Here are those bot-ladies! Metta.Lane: This is a truly impressive build! Pathfinder.Lester: it’s exactly 324 meters high. just like in RL. Arwenna.Stardust: wow so not built to scale – just built! Pathfinder.Lester: i don’t think there are any freebies here. Arwenna.Stardust: I want to bungee jump from the top! Pathfinder.Lester: anyone have any more questions? Lloud.Laffer: Wow, thanks Pathfinder – this exceeded my expectations. The gates are so vital to the experience. Niko.Donburi: so are you storing locations on a notecard then? Jenny.Oliver: Told my island admin in SL about this. I think I sold her to this new experience! Pathfinder.Lester: Niko, that’s what I do, yes. Chimera.Cosmos: which sim has the most freebies here? Pathfinder.Lester: we can make a local tp there now if folks want to. Anastasios.Aurotharius: ty so much for all of this Pathfinder….it’s great! Lloud.Laffer: yes, thanks Path. Also – best wishes on the new job IRL! Pim.Peccable: Did they close Pandora yet? Pathfinder.Lester: Pim, i think so. Pathfinder.Lester: and now I too must head out. RL calls. Pathfinder.Lester: see you on the hypergrid! Chimera Cosmos: who do we ask about Pandora? Do they speak only French? Pathfinder.Lester: take care. have a good night! 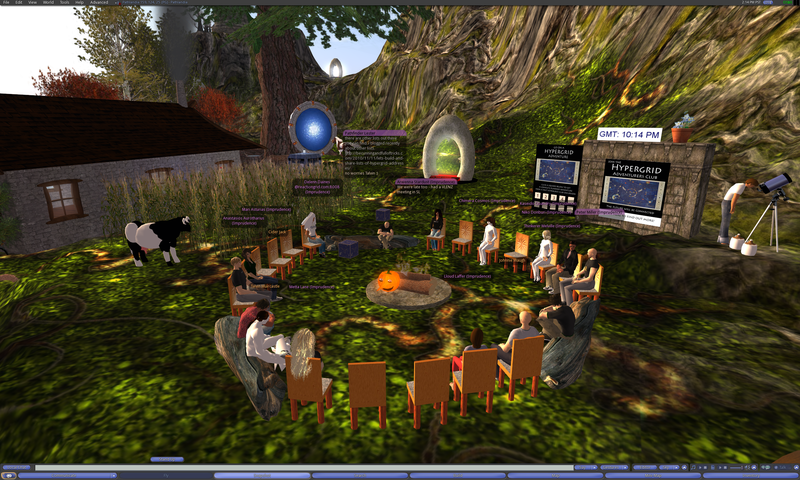 So ends another meeting and excursion of the Hypergrid Adventurers Club! This entry was posted in Announcements, Education, Hypergrid Adventurers Club, OpenSim, Virtual Worlds and tagged avatars, education, francogrid, HyperGate, HyperGrid, Hypergrid Adventurers Club, jokaydiagrid, metaverse, online communities, OpenSim, ReactionGrid, virtual worlds by John "Pathfinder" Lester. Bookmark the permalink. Thanks again Pathfinder – this was so enlightening!